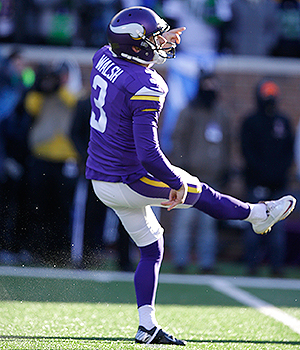 The kicker, Walsh, who had scored all of the Vikings points and was thus the principal reason they were still in the game, pulled the kick left. No matter. He was just playing his role in a drama much older than he is. “At least it was only the fifth-worst loss in our lifetime,” said another friend in Minnesota. This story appears in the Jan. 18, 2016, issue of Sports Illustrated. Subscribe to the magazine here. It was a case of biological ventriloquism. When Bud Grant walked onto the field wearing short sleeves in –20º wind chill before the Vikings-Seahawks game in Minneapolis on Sunday, I was the one—in Connecticut, in front of a fire—who got goose bumps. The Vikings’ 10–9 loss would have resembled a horror movie—The Blair Walsh Project—had we not seen it so many times before. If Minnesota minted its own coins, the motto on the money would be “Uff da,” an all-purpose expletive of Norwegian descent that approximates the sound of being punched in the stomach. • December 28, 1975: In an opening-round playoff game in Minnesota, Cowboys quarterback Roger Staubach throws the game-winning touchdown pass to Drew Pearson, who probably pushed off on Vikings defensive back Nate Wright. The play prompts Staubach to coin the phrase “Hail Mary,” which isn’t the only message from on high that day—referee Armen Terzian is brained by a whiskey bottle thrown from the stands. • January 17, 1999: The Vikings are 11-point favorites at home against the Falcons, winner goes to the Super Bowl. Up 27–20 with two minutes left and looking to ice the game, kicker Gary Anderson attempts a 38-yard field goal. He has made 44 of his previous 44 attempts, but this one—it scarcely needs to be said—goes wide left. Atlanta drives 71 yards to tie a game everyone knows they’ll win in overtime. • January 24, 2010: Tied in the NFC championship game in New Orleans, Vikings quarterback Brett Favre throws an interception at the Saints’ 22 yard line with 14 seconds left in regulation. It is both inexplicable and inevitable. “I can’t believe what I’m seeing right now,” says Vikings radio announcer Paul Allen, who surely can. The Saints, obviously, win in overtime.